I said at the start I had a few similar apps to show you and this is the last of these particle style apps I’m going to be sharing for a while :p. Thanks for sticking by. This is called Fireworks. I can’t be the only one liking this app as it has tons of positive feedback on marketplace (and those guys are pretty harsh critics over there). 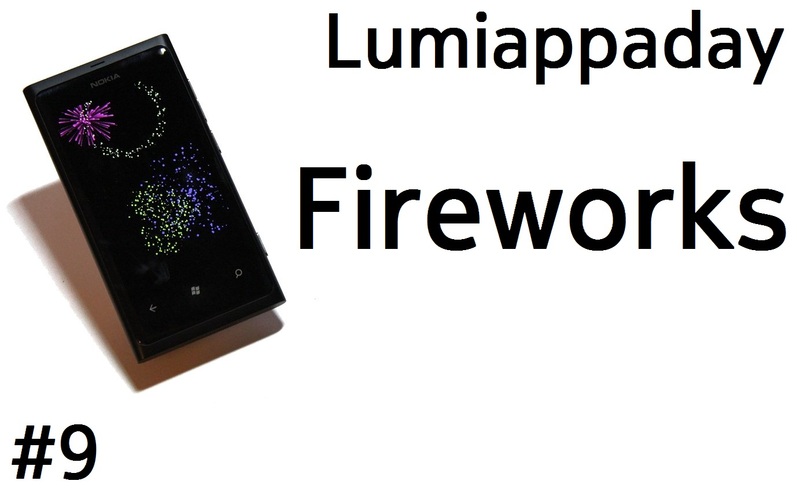 Fireworks is one of the most fun-filled apps on Windows Phone, and a showcase app for multi-touch and graphics. Tap or drag to create brilliant displays of light and sound. Compete or relax in one of several all new game modes. Experience your music, photos, and text in a brand new way. Paint layered art with firework shapes and save or share your work. Or just watch a generated show. How you play is up to you, so get creative. Design: 8 This app replicates fireworks which will appear on their own or you can initiate by touching and dragging the screen, producing colourful fireworks with firework sounds. Even the settings is filled with fireworks. The only thing I don’t like is the papyrus font. Usability: 8 This app oddly ends up in Xbox Live app where games belong. I wouldn’t class this as a game so you might find problems finding where the app is if you didn’t pay attention during the install where it ends up (you can see in the video marketplace automatically showing you xbox live). You can of course initiate this with voice control. Very responsive touch. The fireworks also fall in the direction of the floor (as determined by accelerometer). It works in landscape or portrait which you may find useful for when you set your own backgrounds that might be in landscape. I didn’t like how selecting images from albums ended up with just the square thumbnails and not the full sized pictures. However, setting background as random will pick fullscreen pictures MOSTLY unless they’re in the wrong orientation. These will be faded and darkened so you can still see the fireworks show. Price: 10 Free, add supported. You only see ads however in the menu. When playing fireworks, you get the fullscreen experience. Conclusion: These last three apps, 7, 8 and 9 are just for fun. There might not be an immediate use to them but they still contribute to the app market. Not everyone has the same mindset to be productive all the time. Some want these phones just for the fun of it. Fireworks does that. It works pretty well. If you’re not anywhere near fireworks on new year, you might wanna fire this up :p.
Stay tuned – we’ll be showcasing some fuller, more polished apps next week. « Lumia 710 Coming to US Shores Soon?